The REX importer brings the power and flexibility of REX (rx2) files directly into your Unity project. This amazing new feature makes it possible to import REX files and sync them with music tempos so they stay perfectly in sync with your music stems/tracks or dynamically respond to gameplay events. 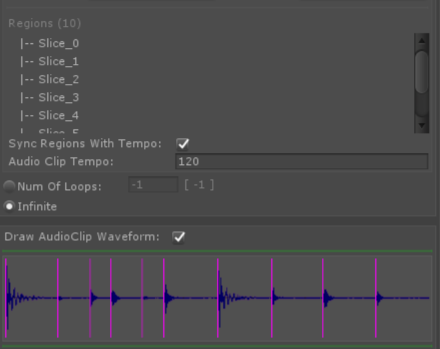 When a REX file is imported Fabric converts the rx2 file into a wavfile with Regions for each segment into the "AudioClip Target Folder". An audio component is created underneath the selected destination component that references the audio clip. Furthermore all regions are automatically loaded and the REX tempo set.